At this point I swear some people think I have CHOCOLATE on the brain. Honestly if you knew how much this could change your life, it would be on your brain too! This Chocolate Based Diet is honestly a life changer. It certainly is for me. First off, this product works so well that it was featured on the cover of the American Journal of Bariatric Medicine. Some consider this to be a Chocolate Diet Solution and others just call it the Cocoa Based Diet. Either way, it is all the rage, works and is even good for your health. Remember when your mom said “An apple a day keeps the doctor away?” She was talking about antioxidants and how good they are for you. She may not have realized it, but antioxidants in the apple had a part in keeping you healthy. 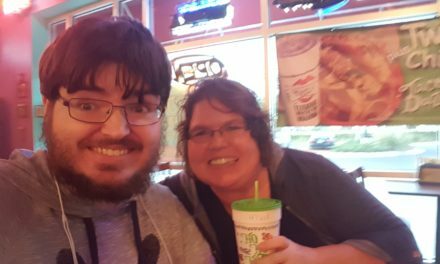 Come to find out that obesity is actually an inflammatory disease. No wonder we spend so much time dieting but are heavier than generations before us. What if I told you that eating cold pressed CHOCOLATE and a CHOCOLATE shake could help you lose weight? You would think I was crazy, right? Well think again. Not only have I personally lost 63 pounds so far, this honestly has the science to back it up. Why does the Cocoa Based Diet work? 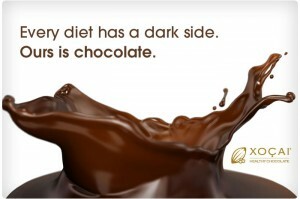 I mean, is it really a Chocolate Diet Solution? Really?!! The cocoa based diet is based on replacing 2 of your meals daily with their Cocoa based Chocolate Meal Replacement Shakes. I have a shake for breakfast, a meal replacement cookie for lunch, 2 healthy snacks and a normal dinner. Even when I just had one shake a day I lost weight, just a little slower. Now I am anxious to lose my last 70 pounds so I prefer to replace two meals a day. You can choose what works for you but all I know is this diet is awesome. I never feel hungry, never feel like I am dieting and that is the best ever. Plus when I do have a craving, and come on, we all do, I just grab a 33 calorie XO Belgian Chocolate power square and eat that with a glass of water. I tell myself I can have whatever I want in 20 minutes, by 9 times out of 10 I am no longer hungry. This works great for those of us who are emotional eaters. Spend years in therapy finding out why you are an emotional eater or grab a power square whenever you want and lose the weight. content of any product I have ever seen. Just one of these meal replacement shakes is over 56,000 antioxidants as verified by Brunswick Labs. That is the equivilent of more than 14 apples in a day. Number one, I can’t even imagine eating 14 apples a day and honestly the cost is prohibitive. So needless to say, this Cocoa diet rocks! 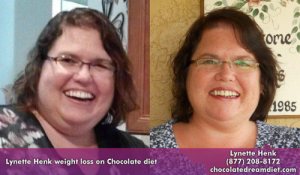 I am Lynette Henk, healthy chocolate promoter. I can be reached at 941-216-5727, at [email protected] or at MyChocolateVitamins.com.